We are starting on the final stretch to finish up Pig Eat Ball! There are five giant worlds in the game. Final-FINAL boss: of course I can't just be content with 10 bosses (5 end + 5 mid)... there has to be more! And don't pretend that was a spoiler.. you have played my games before, right? There's always lots of nasty bosses. World 5 levels: The last world itself has about 20+ levels currently, but needs about 20 more. Those are getting created by Andrew Curry and myself. Cutscenes: We have some of the basics in place telling the story, but now that the game is finally all together, we can go back through and add more flourishes to each cutscene like extra NPC animations and more. That's getting programmed by Matthew Barnes. Trophies, Achievements, localization integration: That's getting worked on by the team at Super Soul. Bugs: All hands on deck! Programmers like myself, Matthew, and the Super Soul team are constantly squashing bugs along the way. I'm finishing up the final fights, and making sure the end of the game is as exciting as the beginning, and doesn't taper off into a let down. The goal is to wrap all this up in the next few weeks! That's a lot of work. But I think it's possible as we're very excited to get the game to the point that we could play it through from start to finish. That will be a big milestone! WISHLIST THE GAME ON STEAM. This is a big help to us, as it shows Valve how popular the game is, plus it reminds you when the game is out! Thanks! 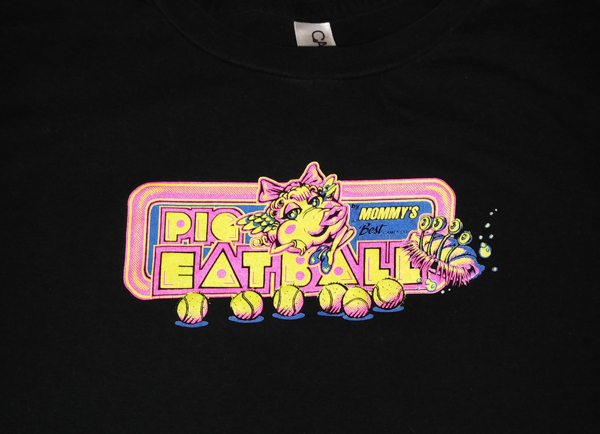 The crowd-funding campaign for our latest game, Pig Eat Ball, will end today at 6pm EST. Already backed it? Thank you! Curious about the game? That's what the demo is for! It works with keyboard/mouse or with an Xbox 360 controller. There's a lot of content in the demo too. 18 levels of single-player action, 3 overworlds, mid-bosses... not to mention a taste of the 4-player party mode! After you played the demo, head over to that crowd-funding campaign. It's with a group called Fig--they're like Kickstarter, but only for games. There's some great backer rewards as well like this swell Ms. Pac-Man style shirt! Check out the campaign and pick a reward. The money we raise now helps us finish up the game nice-like, with proper QA, localization, and an excellent soundtrack.